Part inspirational story of Bea Johnson (the “Priestess of Waste-Free Living”) and how she transformed her family’s life for the better by reducing their waste to an astonishing one liter per year; part practical, step-by-step guide that gives readers tools and tips to diminish their footprint and simplify their lives.Many of us have the gnawing feeling that we could and should do more to limit our impact on the environment. But where to begin? How? Many of us have taken small steps, but Bea Johnson has taken the big leap. Bea, her husband Scott, and their two young sons produce just one quart of garbage a year.In Zero Waste Home, Bea Johnson shares her story and lays out the system by which she and her family have reached and maintained their own Zero Waste goals—a lifestyle that has yielded bigger surprises than they ever dreamed possible. They now have more time together as a family, they have cut their annual spending by a remarkable 40%, and they are healthier than they've ever been, both emotionally and physically.This book shares how-to advice and essential secrets and insights based on the author’s own experience. She demystifies the process of going Zero Waste with hundreds of easy tips for sustainable living that even the busiest people can integrate: from making your own mustard, to packing kids' lunches without plastic, to cancelling your junk mail, to enjoying the holidays without the guilt associated with overconsumption.Stylish and completely relatable, Zero Waste Home is a practical, step-by-step guide that gives readers the tools and tips to improve their overall health, save money and time, and achieve a brighter future for their families—and the planet. I started following Bea Johnson's blog http://zerowastehome.blogspot.com/ a few years ago when I really started to rethink the amount of waste that my household produced and the kind of environmental impact I was making. I did make quite a few changes in my life as a result of her influence, and I find her lifestyle (and this book) to be compelling, challenging, and totally brilliant. Now almost all of my household cleaners are homemade (almost--Arizona's brutally hard water makes powdered dishw I started following Bea Johnson's blog http://zerowastehome.blogspot.com/ a few years ago when I really started to rethink the amount of waste that my household produced and the kind of environmental impact I was making. I did make quite a few changes in my life as a result of her influence, and I find her lifestyle (and this book) to be compelling, challenging, and totally brilliant. Now almost all of my household cleaners are homemade (almost--Arizona's brutally hard water makes powdered dishwashing detergent an impossibility -- just ask my repairman), I buy 70% of our weekly groceries at the farmers' market, and I really try to limit the disposables that enter our home through her recommended bulk shopping methods. Her call to streamline your life makes all of these changes easy, and frankly, harkens back to basic Home Economics. All of your errands in one, right-turn-only trip! 10 vegetables and 4 grains that go into 5 dinners and 6 breakfast/lunches! Use it up, wear it out, make it do, or do without! Many of the ideas here follow basic common sense, and I think if you make a concerted effort, you'll find a great deal of this book to be very reasonable. You just have to make your own system, and forgive yourself (and your trash production) until you can perfect it. Many people will be turned off by this book. Simply put, you will feel ashamed. This book is going to make you feel bad about yourself because it tells you that you need to change the way you do many basic things. Additionally, frustrations pile up pretty quickly when you start trying to change. Want to stop junk mail? Good luck if you don't own your home. Same goes for composting if you don't have a city that does it for you. Recycling for renters is a colossal pain in my town, but I try to buddy up that errand when I can. You just have to be that much more organized, and admittedly, that takes more effort. Johnson has been brutally criticized by readers all across the United States -- saying that she is just a "housewife with too much time on her hands" -- and it's this kind of criticism I find most repellent. Unfortunately, bullying environmentalists is pretty par for the course in my neck of the woods, but there's a new element to it that Bea tends to represent to so many: the female house manager/caregiver/home cook. Feminists, quite understandably, have reacted against Michael Pollan's BS statement about mothers/wives leaving the kitchen and collectively ruining everything ever (geez mom! ), and many feminists are throwing out the baby with the bathwater and rejecting everything Johnson stands for because (in their minds) she tends to represent some kind of alpha stay-at-home mom. Insert conversation about the post-feminist "New Motherhood" and classism here. Anyway, reading her blog proves that this is nothing of the sort (she runs her own business, and she and her husband are both active participants in this no-waste experiment). She spearheaded a major environmental call to action! She's a key figure in the movement! If that doesn't speak to feminist power, then I'm confused about what does. So stop griping about Johnson and quit buying pre-packaged, single-serving cereal that comes in a plastic sleeve, in a cardboard box, inside a shrink-wrapped plastic wrapper. It isn't good for you anyway. So pretentious and illogical.The author, Bea Johnson spends much of the intro discussing how much time she saved now that she no longer spends weekends shopping for furniture for her massive house. Okay, that's reasonable but then she goes on and on about how much time you will save by eliminating possessions and becoming zero-waste. But when you actually read her account of her activities in her new lifestyle you realize she has only reallocated her time. She doesn't seem to have any more free So pretentious and illogical.The author, Bea Johnson spends much of the intro discussing how much time she saved now that she no longer spends weekends shopping for furniture for her massive house. Okay, that's reasonable but then she goes on and on about how much time you will save by eliminating possessions and becoming zero-waste. But when you actually read her account of her activities in her new lifestyle you realize she has only reallocated her time. She doesn't seem to have any more free time.No doubt Bea Johnson is doing impressive things to lower her environmental footprint but her claims of time-saving when she is clearly spending hours making all her own food from scratch, shopping at multiple places all over town, calling dozens of places to find one place that will recycle an item she owns, etc. rings so false it was hard for me to give credibility to much else she said. Furthermore, I found her tone so pretentious and rather snobby. It may have been unintentional but it left a distinct impression that one must be well off, able to have a SAH parent in the home, in order to live this lifestyle. The shopping for calamari steaks is what did me in in the first chapter. I did get a few ideas for reducing my own footprint, but it was a struggle to even read the book because her tone rang so pretentious and false. I learned so much from this book and will be implementing many of her suggestions. My most significant takeaways from the book:1) Reduce junk mail. Top 4 ways to stop receiving junk mail are dmachoice.org, optoutprescreen.com, catalogchoice.org, yellowpagesoptout.com. Bam - I just cut out half my paper mail.2) Composting can considerably reduce what you send to the landfill, since 1/3 of household waste is organic. I'm still deciding on a method, but my goal is to get a compost set up by the end I learned so much from this book and will be implementing many of her suggestions. My most significant takeaways from the book:1) Reduce junk mail. Top 4 ways to stop receiving junk mail are dmachoice.org, optoutprescreen.com, catalogchoice.org, yellowpagesoptout.com. Bam - I just cut out half my paper mail.2) Composting can considerably reduce what you send to the landfill, since 1/3 of household waste is organic. I'm still deciding on a method, but my goal is to get a compost set up by the end of the month.3) There's really no need for paper towels and napkins. Cloth napkins are prettier anyway. I just need to get some good reusable rags for scrubbing and quit the paper towel habit altogether. 4) Buying secondhand is good for the environment. I'm a huge secondhand shopper already (for the financial impact), and I feel motivated to keep it that way for the environmental impact.The author said a couple of times "when you throw something away, where exactly is away?" I can't get that idea out of my head. Trash doesn't disappear. Besides the content of the book (which I obviously loved), I appreciate the tone of the book as well. I found it totally motivating, rather than guilt-tripping or preachy. I feel as though I must first earn some street cred before I go any further:*I cloth diaper*I use vinegar when I clean*I only use cloth napkins*I haven't purchased paper towels in years*I shop at thrift storesI am the target audience for this book. However when the author suggested saving energy by not preheating your oven I almost put the book back into my library bag unfinished. I didn't though because even though as a home cook I found that to be a silly way of saving 4 cents I figured the bo I feel as though I must first earn some street cred before I go any further:*I cloth diaper*I use vinegar when I clean*I only use cloth napkins*I haven't purchased paper towels in years*I shop at thrift storesI am the target audience for this book. However when the author suggested saving energy by not preheating your oven I almost put the book back into my library bag unfinished. I didn't though because even though as a home cook I found that to be a silly way of saving 4 cents I figured the book would still have some valuable information.Then she suggested I start shaving my legs with a straight razor I was done. This book went back to the library unfinished. Sorry lady. A bit too extreme for the average gal with frugal/green tendencies. I read the author's blog and find that she constantly challenges my thinking regarding waste. Is she extreme? Yes. Oh yes. And she knows it and admits it, declaring that she sees herself as the experimenter in order to save everyone else the time of figuring it out. So I was pre-disposed to be interested in this book. And...no. Just no. She's a blogger, not a writer or researcher, and it shows. There was a lot more that could have been done here in terms of making the waste reduction argument an I read the author's blog and find that she constantly challenges my thinking regarding waste. Is she extreme? Yes. Oh yes. And she knows it and admits it, declaring that she sees herself as the experimenter in order to save everyone else the time of figuring it out. So I was pre-disposed to be interested in this book. And...no. Just no. She's a blogger, not a writer or researcher, and it shows. There was a lot more that could have been done here in terms of making the waste reduction argument and setting the call to action and she missed it all in favor of forced alphabetized lists of tips. But I will say...after years of fruitlessly trying to get my husband interested in reducing our waste, I simply left the book lying around the living room for a few days and...presto! He's remembering to bring the reusable grocery bags and thinking about what we buy at the store. So it serves that purpose. Otherwise? Just read the blog. What did I learned from this book? If you live your American Dream(TM) in a giant house, making crap loads of money while having almost unlimited free time, then you can significantly reduce your waste output and as by byproduct reduce your expenses and gain some free time. Otherwise... Perhaps it's because I don't live in USA and my budget is tight, but the small-but-high-impact changes (like not using disposable dishes) have been always part of my life, so the other changes (like make everythi What did I learned from this book? If you live your American Dream(TM) in a giant house, making crap loads of money while having almost unlimited free time, then you can significantly reduce your waste output and as by byproduct reduce your expenses and gain some free time. Otherwise... Perhaps it's because I don't live in USA and my budget is tight, but the small-but-high-impact changes (like not using disposable dishes) have been always part of my life, so the other changes (like make everything you can instead of buying it) are just not realistic -- I just don't have so much free time and money. And also, I quite like my friends. And the whole snobish sound of the book... Zero-waste alternative to eye-lens? Eye surgery! Luckily, I have some sort of "minimal waste" deeply rooted, otherwise I would tart producing waste just because of the sound of the book. I love this book. I read various simplifying/decluttering type books every now & then; this book is not quite that category, but similar in that Johnson has simplified her family's life extensively by trying to avoid creating any trash (zero waste). I think her choices are entirely commendable & she shows that it can actually work for a suburban family of four.Rather than the recycle mantra we all know, Johnson urges much more proactivity with these 5 Rs:* Refuse (stop stuff from coming I love this book. I read various simplifying/decluttering type books every now & then; this book is not quite that category, but similar in that Johnson has simplified her family's life extensively by trying to avoid creating any trash (zero waste). I think her choices are entirely commendable & she shows that it can actually work for a suburban family of four.Rather than the recycle mantra we all know, Johnson urges much more proactivity with these 5 Rs:* Refuse (stop stuff from coming in your home that you do not need: slowing consumption, stopping junk mail, not buying things in single-use plastic containers, etc...)* Reduce (the amount of stuff you need but still use; evaluating consumption habits you have, what can you share/borrow instead, reduce exposure to things that lead to more consumption)* Reuse (reusables vs. disposables; sharing; buying used; repairing or finding a new use for things that you might normally have tossed or replaced...)* Recycle (should be one of your last choices, not a first choice)* Rot (compost)I especially loved all her details about her grocery shopping w/ reusable containers & love the simplicity of her solution. I also really enjoyed how she went through various areas of the house, giving lists of how to evaluate what you have, what to get rid of/keep (simplifying is a part of zero waste), & what she kept & what she got rid of from her own house. For example, a lot of stuff left her kitchen, including a vegetable peeler (now her family eats more veggies w/ the skins on, getting more nutrition; if she does need to peel something, she just uses a knife) & her can opener (they don't buy food in cans). Both of those items were things that I, personally, would have never even considered during a cull, so I found it eye-opening to see her list of what didn't make it -- making me see what we have in a new light. At the end, she muses on what she hopes the future is/can be if more people tried to live a zero waste lifestyle & I greatly enjoyed her 'vision' (which, as it turns out, she says are things that already exist in limited amounts in limited places around the world -- now the world just needs to adopt better practices & expand the zero waste lifestyle).Also, for books of this type, this is well-written, well-organized, & her resources at the end match up exactly with the order of each chapter. So, it even appealed to me on an editorial level. I guess I noticed it because in that area, this book is definitely heads above others books of similar ilk.I think some don't like her choices or the extremes to which she has gone (easy to dismiss what she has done as unattainable), but I think it takes people willing to buck the norm, stand up & make different choices, & show by example why their way might be a better way. I see Bea Johnson as being that type of person.I'm nowhere near what she lives, but her choices & suggestions make a lot of sense to me & I'm definitely planning to take a hard look at our lives & attempt to push us toward more of a zero waste life. I love her blog already (plus her gorgeous, spare house that she has photos of on her blog) & found her book to be a great companion to her blog: http://zerowastehome.blogspot.com/ If you are interested in this lifestyle, I'd heartily recommend both her blog & the book. I definitely admire a woman on a mission. And it's always nice to read a missive by someone with even more crazy-out-there ideas than my own. The problem with this book for me was that the simplicity goal and the zero-waste goal are two entirely different things, and I can't quite see how to implement them without contradiction. How am I supposed to get my wardrobe down to, like, 25 pieces total, for example, without getting rid of basically everything I own and then purchasing those 25 magical I definitely admire a woman on a mission. And it's always nice to read a missive by someone with even more crazy-out-there ideas than my own. The problem with this book for me was that the simplicity goal and the zero-waste goal are two entirely different things, and I can't quite see how to implement them without contradiction. How am I supposed to get my wardrobe down to, like, 25 pieces total, for example, without getting rid of basically everything I own and then purchasing those 25 magical high-quality, neutral-colored, super-versatile pieces? Wouldn't I just be purchasing 25 things I didn't need, since I already have a closet full of clothes right now? I know this sounds like nitpicking, but I had similar problems with maybe half of her suggestions. And of the half that didn't frustrate or annoy me in some way, I can see myself actually implementing maybe half of those. Still, I guess that's a bit less trash heading to the landfill, and that's a step in the right direction. Aš niekada nebuvau išprotėjus dėl ekologijos, rūšiavimo ir panašių dalykų. Tuo nesididžiuoju, bet ir vaidinti kažko neketinu. Viskas pasikeitė, kai gimė vaikas. Tuomet tapo svarbu daug dalykų ir kokį pasaulį paliksiu po savęs - vienas jų. Knyga “Namai be atliekų” į mano akiratį pateko jau senokai, bet eilė pribrendo tik dabar. Na ir ką aš galiu pasakyti- leidykla Dvi tylos, kuri ir išleido knygą, labai taikliai apibūdino savo leidžiamas knygas - jos skirtos žengiantiems su pasauliu ir ieškantiem Aš niekada nebuvau išprotėjus dėl ekologijos, rūšiavimo ir panašių dalykų. Tuo nesididžiuoju, bet ir vaidinti kažko neketinu. Viskas pasikeitė, kai gimė vaikas. Tuomet tapo svarbu daug dalykų ir kokį pasaulį paliksiu po savęs - vienas jų. Knyga “Namai be atliekų” į mano akiratį pateko jau senokai, bet eilė pribrendo tik dabar. Na ir ką aš galiu pasakyti- leidykla Dvi tylos, kuri ir išleido knygą, labai taikliai apibūdino savo leidžiamas knygas - jos skirtos žengiantiems su pasauliu ir ieškantiems tikrumo. Be to sakinys knygos gale suintrigavo - Bea Johnson, knygos autorė, su šeima per metus sugeneruoja šiukšlių, kurios tilptų į vieno litro stiklainį. O per kiek jūs su šeima pripildote tokią talpą? Per 1 valandą? Per dieną?Leidinys kokybiškas - pradedant vizualiais dalykais, tokiais kaip popierius, maketavimas ir baigiant turiniu. Autorė su gera autoironijos doze pasakoja savo kelionę į zero waste - supaprastintą gyvenimą ir sumažintą atliekų kiekį. Praktinių ir labai naudingų patarimų daug. Ypač patiko filosofiniai autorės pamąstymai apie vartojimą, komerciją ir pan. Užkliuvo tai, jog visos knygos metu autorė teigia, jog toks gyvenimo būdas nereikalauja daug laiko ir visą save galite skirti tikriems dalykams: šeimai, savęs realizacijai, bet kartu atskleidžia kiek daug dalykų tenka daryti norint palaikyti zero waste sistemą: gaminti higienos, makiažo priemones, ieškoti kur apsipirkti nepažeidžiant savo principų ir pan. Iš kitos pusės - nereikia norėti, kad gyvenimo būdas pasikeistų per minutę. Į jį reikia įeiti ir pakeisti praktiškai visus savo įpročius.Kaip ten bebūtų, manau kiekvienas bent kiek toliau savo nosies matantis ir mąstantis žmogus privalo perskaityti. Niekas nesitiki, kad 100 procentų pereisite prie gyvenimo be atliekų būdo, bet kažkurią dalį perimti tikrai galima ir bent taip prisidėti prie geresnio pasaulio ateities kartoms kūrimo. Bent jau mane ši knyga tikrai įkvėpė toliau domėtis ir keisti savo įpročius. Earlier this summer, some friends and I talked about cults. One friend told another, "You'd be in the zero-waste cult," and we all thought this was hilarious. Now that I've read this book, I no longer find it facetious to conflate zero-waste living with cult membership.In fact, according to Goodreads, Bea Johnson is the "Priestess of Waste-Free Living." I don't think this is an exaggeration. It requires a level of religious devotion to take the zero-waste lifestyle as far as this lady does, and Earlier this summer, some friends and I talked about cults. One friend told another, "You'd be in the zero-waste cult," and we all thought this was hilarious. 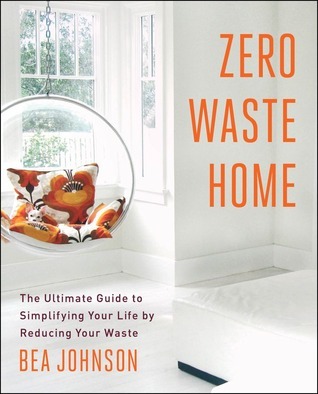 Now that I've read this book, I no longer find it facetious to conflate zero-waste living with cult membership.In fact, according to Goodreads, Bea Johnson is the "Priestess of Waste-Free Living." I don't think this is an exaggeration. It requires a level of religious devotion to take the zero-waste lifestyle as far as this lady does, and although it clearly works for her life and interests, this book may turn normal people off from zero-waste living, because she makes the lifestyle seem obsessive-compulsive, unsustainable, and potentially damaging to social relationships. Also, despite all her ravings about how her family saves so much money and lives a far more simple life, one needs to live in a fairly affluent area to have access to all of the resources she has, and there is nothing simple about this lifestyle. As I tweeted after finding one of the recipes in this book, "Going zero waste saves the planet!! Restores humanity!! SIMPLIFIES LIFE! Also here is a time-consuming recipe to set almonds on fire and grind them up into eye shadow!! "The disclaimer at the beginning of the book says that "the reader should consult his or her medical, health, or other competent professional before adopting any of the suggestions in this book or drawing inferences from it." When you read something like that, you know it's about to get REAL. However, even though she does advocate peeing into your compost or a citrus plant, many of the recommendations in this book actually have merit. She gives lots of ideas for how to reject consumerism, buy in bulk, and deal with holidays. Many authors like this say, "Prioritize experiences, not material gifts!" but then give no recommendations for what kind of intangible gifts you should give. She provides a whole list of potential ideas, and even though they wouldn't all work for everyone, it's clear that she lives this out, and isn't just spouting platitudes.She gives lots of handy household trips and tricks, and has good advice for how to get rid of items you already have without putting them in the landfill. The most valuable thing I learned from this book is that Goodwill accepts bags of worn-out clothes and fabric scraps destined for the landfill. Goodwill sells these items to textile recyclers, who grind the fabric down for reuse in other products. I’m so glad that I learned this, especially since one of my upcoming projects was to declutter my sewing supplies. I’ve now filled up a whole bag of worthless or unwanted fabric scraps to take to Goodwill.However, even though she has great information about resources, many of her personal ideas for waste reduction require so many extra steps and so much effort that they hardly seem worthwhile. This book is also full of laughable contradictions, even on the same page. She tells you that when you ship something, you should reuse an old box, but then she tells you to avoid sticker or paper labels, and to write directly on the box. HOW DO YOU DO THAT IF YOU’RE REUSING IT? !Also, even though this author goes to very real and commendable lengths to avoid judgment, encouraging people to do what is right for them without trying to force it on all their friends and family, she is oblivious to how privileged she is. She never once acknowledges that people in highly concentrated, poverty-stricken urban areas often depend upon packaged and processed foods, since transportation costs for produce can make it prohibitively expensive in those areas. She doesn’t seem aware that when a family has two working parents, they won’t have time to shop all over town for unpackaged food and make their own household and toiletry items from scratch. She is also so sanctimonious about family size that I dropped my rating from three stars to one.She recommends that once couples have two biological children, they should adopt instead of “breed.” Adoption is a wonderful thing that should be normalized as an inherent good, rather than Plan B, but I despise her spiel about how couples should avoid reproduction in order to reduce tax on the planet. Firstly, when she talks about how much the population has expanded over past generations, she makes it sound like this is because people are running around making babies too often, when in reality, the population has expanded because mortality rates have lowered and standards of living have greatly improved. She doesn't cite her statistics, and nor does she explain why things have changed, and that's a very poor foundation to begin with.Secondly, even though she can talk piously about birth control all she wants, I know and love large families, and how DARE she suggest that every additional child is a waste of space and resources. If she wants to limit her family size to two children, she has the freedom and privilege to do so, but she has no right to shame large families and pretend that she’s an expert on family planning. I know that using birth control to eliminate the possibility of conception is very different than exterminating existent lives, but this woman is presuming authority not only over what you should do with your waste, or what you should buy at the grocery store, but over what human beings should exist in the world and be part of your family. Some of my best friends are members of large families, and parents often raise multiple children with the hope that these kids can grow up to change the world. I have much more respect for the invested, intentional parents who raise wonderful kids than for this lady’s investment and intention in eliminating waste. I was willing to look past so many irritants and so much silliness to learn helpful household and environmental practices, but as soon as she told me that the world would be better off without some of my best friends, I was DONE. I am OUT. Goodbye, Priestess of Waste-Free Living. You can pursue your obsessive waste-reducing lifestyle while I enjoy the things that actually matter in life. Ця книга вразила мене абсолютною відданістю авторки справі. Звісно, коли вирішуєш взяти активну участь у боротьбі проти сміттєутворення, необхідно братися за це з усіх сторін. Книга містить вступну частину про перехід до zero waste авторки (власний досвід), а потім розподіляється на розділи про те як зменшити своє сміттєутворення та повторно використати/переробити речі у різних частинах дому: кухня, ванна, офіс, спальня, а також про життя за межами дому, що робити на свята і так далі. Тут ви зна Ця книга вразила мене абсолютною відданістю авторки справі. Звісно, коли вирішуєш взяти активну участь у боротьбі проти сміттєутворення, необхідно братися за це з усіх сторін. Книга містить вступну частину про перехід до zero waste авторки (власний досвід), а потім розподіляється на розділи про те як зменшити своє сміттєутворення та повторно використати/переробити речі у різних частинах дому: кухня, ванна, офіс, спальня, а також про життя за межами дому, що робити на свята і так далі. Тут ви знайдете рецепти як створити власні миючі засоби, конкретні ресурсозберігаючі поради типу покладіть цеглину в бачок зливу, схеми як пошити багаторазові менструальні прокладки, посилання на корисні ресурси, навіть те, як пояснити сусідам що на Хелоувін діти бажають отримати солодощі без упаковки. Так, напевно найбільше мене вразив розділ про дітей: у авторки є двоє синів, і вона знову ж таки дає конкретні поради щодо того, як виховувати дітей у русі zero waste. Це все може здатися безумством, це і є безумством у нашому схибленому на споживанні світі. Але все формує звичка. Колись я обожнювала бараняче м`ясо на шпажках, та тепер не їм м`ясо, і не можу собі уявити щоб колись повернулась до цього. Обізнаність, сила волі, сила звички, пошук альтернативи, відданість добрій справі - це найважливіше. Це плавання проти течії кожен день цілий день без перепочинку. Я схиляю перед Беа Джонсон капелюха. Такими людьми треба пишатися. This past half a year or so we've been living full-time on the road in a house on wheels. We've seen such beautiful places with landscapes varying from mountainous depths filled with elk and reindeer, the unique colors of the desert to a flatter place here in Florida covered in lakes and a wide array of birds. I love nature. I love this planet and I want to keep it beautiful. Unfortunately, we are trashing it without acknowledgment for our waste and actions. Granted, the planet will always be he This past half a year or so we've been living full-time on the road in a house on wheels. We've seen such beautiful places with landscapes varying from mountainous depths filled with elk and reindeer, the unique colors of the desert to a flatter place here in Florida covered in lakes and a wide array of birds. I love nature. I love this planet and I want to keep it beautiful. Unfortunately, we are trashing it without acknowledgment for our waste and actions. Granted, the planet will always be here. It is ourselves we are dooming to extinction, but we're taking others down with us. We're depleting the oceans with our waste, the bees and dirt with our pesticides, our air with our poor choices of what we eat. Since roughly 2007 I have made strides to live more sustainably. And now, knowing there is always more I can do, I'm pleased to come across books like this and people like Bea who are showing what is possible. Even if viewed as extreme, it's no sweat off my back because I've always been viewed as extreme. To me, extreme is what we are doing to the planet and how often we are willing to look away and not take responsibility. All it takes are little actions that build up to being great things. So, I now strive to live as plastic and completely waste free as I can. And boy has it been liberating and enlightening all the same. I'm excited for this next chapter and hope more consider living with less waste, a smaller impact but a greater and more mindful heart. I like reading books like this and usually find them motivating even if not all of the advice applies to me. There are some good ideas in this one. But, yes, like other reviewers have pointed out, the author is kind of insufferable. Most of her personal stories are thinly-veiled humblebrags. Like the time she got a short hair cut to reduce her shampoo use, but it did nothing for her face and a magazine camera crew came to photograph her and her family! Oh no! (Is this story supposed to convey hu I like reading books like this and usually find them motivating even if not all of the advice applies to me. There are some good ideas in this one. But, yes, like other reviewers have pointed out, the author is kind of insufferable. Most of her personal stories are thinly-veiled humblebrags. Like the time she got a short hair cut to reduce her shampoo use, but it did nothing for her face and a magazine camera crew came to photograph her and her family! Oh no! (Is this story supposed to convey humility?) Some of the advice is also quite ridiculous. Like having makeup tattooed on your face instead of buying cosmetics (Jesus Christ!) or using a chocolate chip to draw on your table instead of using a centerpiece (lol). She also references flying a lot with no mention of the environmental impact (unless I missed that), and she's not even vegan, so you know she's really just a big ol' poser. She also rails against food processors. WHAT? How does she make hummus???? Cinco estrelas para um livro inspirador.Pode parecer radical. As suas sugestões podem parecer idealistas ou irrealistas.No entanto, a premissa base, que leva ao Desperdício Zero, é a simplificação da nossa vida. Na base está a ideia que muito aprecio: consumir menos, trabalhar menos, viver mais!No fundo, quanto menos precisarmos/desejarmos, menos consumimos, menos dinheiro e TEMPO gastamos.Recusar, Reduzir, Reutilizar, Reciclar e Compostar para sermos mais livres e mais felizes. Para Ser em vez Cinco estrelas para um livro inspirador.Pode parecer radical. As suas sugestões podem parecer idealistas ou irrealistas.No entanto, a premissa base, que leva ao Desperdício Zero, é a simplificação da nossa vida. Na base está a ideia que muito aprecio: consumir menos, trabalhar menos, viver mais!No fundo, quanto menos precisarmos/desejarmos, menos consumimos, menos dinheiro e TEMPO gastamos.Recusar, Reduzir, Reutilizar, Reciclar e Compostar para sermos mais livres e mais felizes. Para Ser em vez de Ter.Li este livro e lembrei-me do filme Fight Club e da poderosa mensagem do ex-presidente do Uruguai, José Mujica.Para além da teoria, é um livro cheio de dicas para estarmos mais atentos à nossa pegada ecológica e fazermos o que conseguirmos para reduzir o lixo que produzimos e os recursos que consumimos. Ok ok. I feel kind of cruel for rating this a book a two, as it's chock-full of tips to pare down on wasteful habits. But, I couldn't take it seriously: Although Bea's successful adoption of a Zero-Waste lifestyle is absolutely impressive, who the h*ll would want to live this way? "Scott could no longer stand the 'smell of vinaigrette' in our bed." (p. 6)Re: bathroom beauty products -- "Our insecurities clutter our lives." (p. 82)"Dry Shampoo: I substitute cornstarch sold in bulk for dry shampoo. Ok ok. I feel kind of cruel for rating this a book a two, as it's chock-full of tips to pare down on wasteful habits. But, I couldn't take it seriously: Although Bea's successful adoption of a Zero-Waste lifestyle is absolutely impressive, who the h*ll would want to live this way? "Scott could no longer stand the 'smell of vinaigrette' in our bed." (p. 6)Re: bathroom beauty products -- "Our insecurities clutter our lives." (p. 82)"Dry Shampoo: I substitute cornstarch sold in bulk for dry shampoo...you can sprinkle it on the oily roots of your hair, massage in, and brush. Enjoy the added volume!" (p. 91)"Supplemental options for women -- Sugaring: Waxing with sugar originated in ancient Egypt and is still used in Arab countries today. Also referred to as halawa (meaning 'sweet'), it can be a dessert or a great alternative for those adept at waxing! It is tricky but well worth the effort." (p. 92) H*LLAWA NO.Re: clothes, "Stay away from colors or patterns that are too casual. Acid washes and tie-dye rainbows are restrictive; they cannot be dressed up for a formal event." (p. 124) Really? I'm kind of curious to prove her wrong. "How did your kids give up Oreos?" (p. 183) She never answered this question. "The fear of being different is almost universal and especially pervasive in children. Refusing requires tremendous courage, but kids build lasting confidence when they meet challenges like this, and they become examples for others. Our boys find it difficult to say no to free candy, but they have learned..." (p. 192) I am beginning to hate this woman.Re: Trick-or-Treating on Halloween -- "I am not at all against the trick-or-treat tradition. The freebies are, after all, the force behind consistent turnouts. Here are items to consider: A box of organic raisins, a whole fruit, a licorice root stick..." (p. 223) I would egg this woman's house. "Does this seem overzealous? Well, it isn't." (p. 264) Oh really?I started to read this book after I realized I may be stuck indoors for a while, and/or cut off from resources. It helps you realize "where there's a will, there's a way". Also, good to know black sesame oil is a natural sunblock, and I definitely want to try an at-home recipe for kohl eyeliner. But, humans leave an indelible mark on this planet, and I got the feeling guilt from her former life drove her to want to erase herself. Je pensé que j'était très soucieux de l'environnement, mais aprés lire ce livre, j'ai réalisé que j'ai encore un long chemin à parcourir pour être en mesure de me sentir vraiment fier de mes efforts sur l'environnement...Contrairement à certains lecteurs qui ont trouvé les suggestions de l'auteur et le ton radical de son écriture snob, j'ai trouvé le livre une lecture très agréable et inspirante. L'auteur reconnaît que dans le début, l'enthousiasme l'a amenée à tester des choses un peu radicales Je pensé que j'était très soucieux de l'environnement, mais aprés lire ce livre, j'ai réalisé que j'ai encore un long chemin à parcourir pour être en mesure de me sentir vraiment fier de mes efforts sur l'environnement...Contrairement à certains lecteurs qui ont trouvé les suggestions de l'auteur et le ton radical de son écriture snob, j'ai trouvé le livre une lecture très agréable et inspirante. L'auteur reconnaît que dans le début, l'enthousiasme l'a amenée à tester des choses un peu radicales, mais elle les raconte avec de l'humeur et sens de l'auto-critique. À la fin, elle a adopté ce qu'elle pense en vaut la peine dans leur cas particulier.Ce livre m'a rendu plus conscient de mes habitudes de consommation: il a dejá changé certaines pour le mieux et j'espère que dans l'avenir il va changer encore plus. This book walks the line between useful advice and things that are incorrect or completely ridiculous. The author seems to think that previous civilizations didn't have waste (not true, what do you think archeologists find?) and also notes items that she believes can be composted which cannot if you are intending to actually use the compost in your edible garden. She also notes using a glass container in the shower for shampoo which seems to me to be a rather significant safety hazard. My bigges This book walks the line between useful advice and things that are incorrect or completely ridiculous. The author seems to think that previous civilizations didn't have waste (not true, what do you think archeologists find?) and also notes items that she believes can be composted which cannot if you are intending to actually use the compost in your edible garden. She also notes using a glass container in the shower for shampoo which seems to me to be a rather significant safety hazard. My biggest gripe with this book, however, is the statement that her household is close to zero waste. It's a logical fallacy. She "refuses the grocery receipt" when purchasing items which just means the grocery store has to throw it away and on numerous occasions she notes buying things that someone else has already removed the packaging on (buying floor models for instance). Just because she's not physically throwing away the trash does not mean that it was not created. I would much rather accept the store receipt and recycle it or shred and compost it myself than have it go in the store's waste basket.One additional quibble with the book is that the author's children were older when her family began this journey and as such, there is very little content related to the rearing of small children. You may be able to give a teenager a glass lunch container or a locally-source pottery plate but I wouldn't try it with a 2-year-old. She cannot help that this is her family experience but I would have appreciated some research on the subject rather than a couple of paragraphs of opinion that come across as a judgmental shoulder shrug.Reducing our consumption and voting with our dollars by selecting products that adhere to the values we support are valid but when the message is obfuscated with weird and self-deluding behaviors (refusing hostess gifts because they're not packaged in recycled materials), I do not find the message to be as useful or as strong. There are some good idea lists in here but overall, this book is very California with all the self-indulgent perspective and bountiful access that provides. The author says at the top of the book that people won't necessarily try all of her suggestions, and that some of them are more extreme than others. Still, it's really hard to take a book seriously when it suggests cutting down on make-up waste by getting eyeliner permanently tattooed on - or make your own by burning almonds. Perhaps, just don't use eyeliner instead?As Johnson predicted, I certainly won't be adopting all of her techniques, but this book is a good reminder that even if you don't The author says at the top of the book that people won't necessarily try all of her suggestions, and that some of them are more extreme than others. Still, it's really hard to take a book seriously when it suggests cutting down on make-up waste by getting eyeliner permanently tattooed on - or make your own by burning almonds. Perhaps, just don't use eyeliner instead?As Johnson predicted, I certainly won't be adopting all of her techniques, but this book is a good reminder that even if you don't aim for zero waste (or for her family, one quart-sized container per year), there are still a lot of very simple ways to cut down on our own individual waste, and that reduction could be beneficial not just to the earth, but also our pocketbooks and our health. I won't be feeding my dog garlic to prevent fleas (isn't garlic poisonous for dogs? ), but I can wash and re-use my sandwich bags more. There are lots of great tips in here on how to eliminate garbage from your life, although sorting them out of the insanity of the writer's persona is hard work. At a certain point (probably the makeup section), her absolute awfulness becomes so over the top it turns into a comedy. I might read this book again to use as a drinking game!But well worth reading for the final chapter, which presents an inspiring and nearly magical vision of a society that's serious about living ecologically.